This book was a rare and unexpected pleasure to discover. With a Ph.D. in the Philosophy of Religion, from a leading university, I was not expecting much from a theological work written by the former CEO of Marvel Comics. I was surprised. This book provides the grist for a revolution in theology by providing translation of the Leningrad Codex, a Hebrew Bible compiled from lost ancient sources that predates the King James translation of the Bible that has dominated the Christian worldview. By offering fresh interpretations of ancient texts, the Freeware Bible enables us to see how the King James Version was translated through glasses colored by Church doctrine and political monarchy. The possibilities of substituting alternative words both enable the reader to take off those glasses and reconstruct passages in ways that are more consistent with contemporary scientific worldviews. 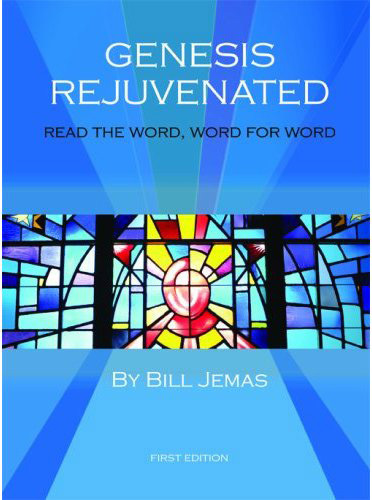 Genesis Rejuvenated contains Bill Jemas’ attempt to reconstruct the creation story in Genesis 1 in a way that is far more natural and commonsense than the version we inherited in the King James Bible and the English translations that followed it. It gives us far greater appreciation for the ancient civilizations that predated the Babylonian exile of the Jewish people that created the Hebrew Bible. 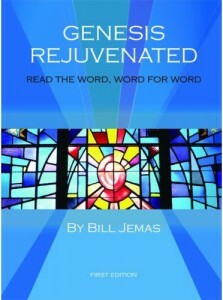 The main problem the reader faces is to try to figure out how to reassemble the words in the Freeware Bible database to take it beyond the postmodern information age of “Wikipedia”—where anyone’s interpretation can be presented—to what is becoming called an integral worldview that applies generally recognized natural and social principles to the volumes of information available. Jemas takes up this challenge and creates his own translation of Genesis 1 in a way that describes the story of the Creation that removes the polarization in the current Creation -Evolution debates. While his rendition must be considered experimental and not some new authoritative consensus on the best translation our present world is capable of rendering, I found it surprisingly preferable to the inherited English Bible. I think this work is going to be difficult to find an audience in established circles because it challenges the foundations of Christian Civilization and offers new ways of conceiving basic doctrines relating to Creation, the Fall, and Human Society as they may have been understood in the ancient Near East. Jemas is a pioneer ahead of the curve. I hope he gets some recognition for what he has contributed to the foundation of a new integral Bible that is at once both more true to the original writings and to the human soul.